Kaitlin had a program at school this morning. 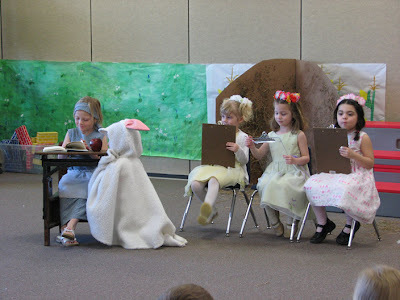 It was a collection of Mother Goose Nursery Rhymes put on by the children and it was pretty adorable. My dad happened to be in town for an appointment, so he came to watch, too. Kaitlin was pretty tickled when she saw that Grandpa Joe had come to watch. 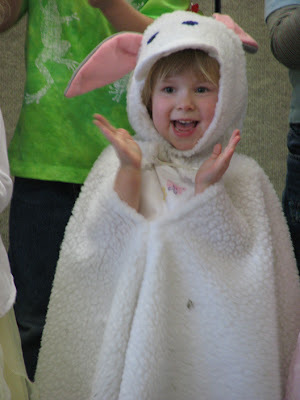 Kaitlin was the lamb of "Mary had a little lamb...". Later in the program, all the preschoolers stood on the risers to sing Pat-a-Cake and Star Light, Star Bright complete with actions. Unfortunately, Kaitlin's costume wasn't quite conducive to all the choreography, but she made do. 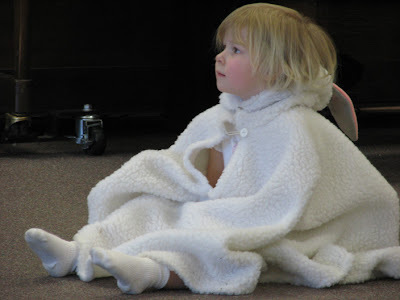 Here's one tired (and hot) little lamb watching the rest of the program.